Antibody replacement therapy for patients with antibody deficiencies contains only IgG. As a result, concurrent IgM and IgA deficiency present in a large proportion of antibody deficient patients persists. Especially patients with IgM deficiency remain at risk for recurrent infections of the gastrointestinal and respiratory tract. The lack of IgM in the current IgG replacement therapy is likely to contribute to the persistence of these mucosal infections because this antibody class is especially important for complement activation on the mucosal surface. We evaluated whether supplementation with IgM increased serum bactericidal capacity in vitro. Serum was collected from a patient with agammaglobulinemia and supplemented with purified serum IgM to normal levels. Antibody and complement deposition on the bacterial surface was determined by multi-color flow cytometry. Bacterial survival in serum was determined by colony-forming unit counts. We present a patient previously diagnosed with agammaglobulinemia due to CD79A (Igα) deficiency revealing a novel pathogenic insertion variant in the CD79a gene (NM_001783.3:c.353_354insT). Despite IgG replacement therapy and antibiotic prophylaxis, this patient developed a Campylobacter jejuni spondylodiscitis of lumbar vertebrae L4–L5. We found that serum IgM significantly contributes to complement activation on the bacterial surface of C. jejuni. 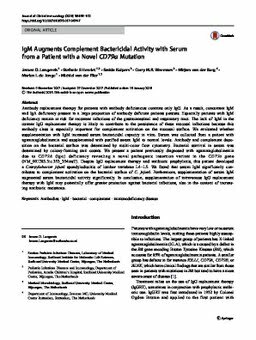 Furthermore, supplementation of serum IgM augmented serum bactericidal activity significantly. In conclusion, supplementation of intravenous IgG replacement therapy with IgM may potentially offer greater protection against bacterial infections, also in the context of increasing antibiotic resistance.